Get out of town with these interesting Cairo side-trips: Giza (Pyramids of Giza, Step Pyramid of Djoser, & more). Spend the 3rd (Sun) behind the viewfinder with an inspiring photography tour. And it doesn't end there: examine the collection at Egyptian Antiquities Museum, admire the striking features of Hanging Church (El Muallaqa, Sitt Mariam, St Mary), make a trip to Old City (Coptic Cairo), and get a taste of the local shopping with Khan Al-Khalili. To find maps, more things to do, reviews, and tourist information, read our Cairo trip planner . The Route module can give you travel options from your home to Cairo. In March, daily temperatures in Cairo can reach 29°C, while at night they dip to 17°C. Cap off your sightseeing on the 7th (Thu) early enough to go by car to Bawiti. El-Bawiti is a town in the Western desert in Egypt. 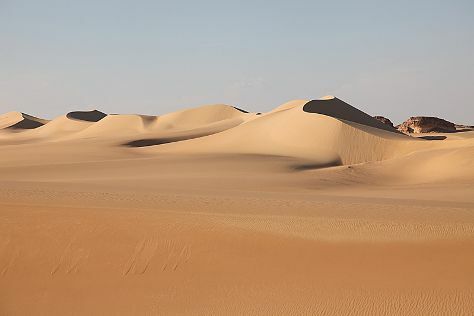 On the 8th (Fri), take in the dramatic natural features at Bahariya (Bahereya) Oasis, get to know the fascinating history of Old Bawiti, take an in-depth tour of Oasis Heritage Museum, then appreciate the extensive heritage of Palmeraie, and finally explore the ancient world of Gebel al Ingleez. To find traveler tips, maps, more things to do, and tourist information, go to the Bawiti tour itinerary planner. You can drive from Cairo to Bawiti in 5 hours. Alternatively, you can do a combination of flight and taxi. Finish your sightseeing early on the 8th (Fri) so you can drive to Siwa. Start off your visit on the 9th (Sat): contemplate the long history of Shali Fortress, then step off the mainland to explore Fatnis Island (Fantasy Island), and then admire nature's extreme beauty at Great Sand Sea. 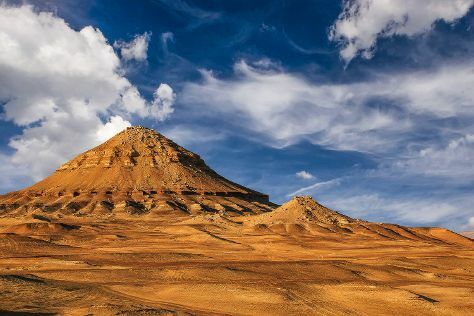 Here are some ideas for day two: delve into the distant past at Mountain of the Dead, then explore the ancient world of Temple of the Oracle of Amun / Aghurmi, then take your sightseeing to a higher altitude at Dakrur Mountain, and finally contemplate the waterfront views at Lake Siwa. For other places to visit, ratings, more things to do, and tourist information, read Siwa vacation planning website . You can drive from Bawiti to Siwa in 13 hours. Finish your sightseeing early on the 10th (Sun) so you can drive to Alexandria. Explore hidden gems such as Deutsche Kriegsgraeberstatte and Bibliotheca Alexandrina. Go for a jaunt from Alexandria to El Alamein to see El Alamein War Cemetery about 1h 55 min away. And it doesn't end there: admire the natural beauty at Montazah Palace Gardens, steep yourself in history at Fort Qaitbey, appreciate the history behind Pompey's Pillar, and take in the spiritual surroundings of St.Mina Monastery. To find reviews, more things to do, ratings, and other tourist information, read our Alexandria trip itinerary tool . You can drive from Siwa to Alexandria in 8 hours. Expect a daytime high around 26°C in March, and nighttime lows around 15°C. Finish your sightseeing early on the 15th (Fri) so you can travel to Saint Catherine. Kick off your visit on the 16th (Sat): ponder the world of politics at The Cascades at Soma Bay, take in the spiritual surroundings of St. Anthony's Monastery (Deir Mar Antonios), then take in the awesome beauty at Mount Sinai, and finally steep yourself in history at St. Catherine's Monastery. 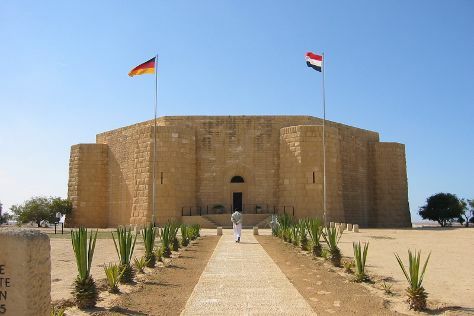 Keep things going the next day: explore the gorgeous colors at Ras Mohommed National Park and then enjoy the sea views from Daedalus Reef Lighthouse. To find traveler tips, photos, reviews, and tourist information, refer to the Saint Catherine day trip planning site . Do a combination of flight and taxi from Alexandria to Saint Catherine in 5 hours. Alternatively, you can drive; or do a combination of bus, flight, and taxi. Traveling from Alexandria in March, plan for slightly colder nights in Saint Catherine, with lows around 9°C. Cap off your sightseeing on the 17th (Sun) early enough to travel to Taba. Taba is a small Egyptian town near the northern tip of the Gulf of Aqaba. Kick off your visit on the 18th (Mon): take in breathtaking views at Coloured Canyon, then stroll through Wishwashi Canyon, and then step into the grandiose world of Castle Zaman. Keep things going the next day: step into the grandiose world of Salah El-Din Castle and then tee off at Taba Heights Golf Resort. For other places to visit, more things to do, and other tourist information, refer to the Taba trip itinerary site . You can take a bus from Saint Catherine to Taba in 2 hours. Alternatively, you can drive. In March, daily temperatures in Taba can reach 24°C, while at night they dip to 9°C. Wrap up your sightseeing on the 19th (Tue) early enough to take a bus to Dahab. You'll explore the less-touristy side of things at Coral Reefs and Horseback Riding Tours. When in Dahab, make a side trip to see Ain Khudra in Nuweiba, approximately 50 minutes away. Spend the 20th (Wed) among aquatic life with a scuba or snorkeling tour. Make the 23rd (Sat) an unforgettable day with an extreme tour. Next up on the itinerary: head outdoors with Blue Lagoon, appreciate the history behind Wadi Zaghara, take in the exciting artwork at WICKEDiCANDY, and enjoy some diversion at Sandana Sandboarding. For maps, other places to visit, photos, and more tourist information, use the Dahab route builder website . Take a bus from Taba to Dahab in 2 hours. Alternatively, you can drive. Traveling from Taba in March, things will get somewhat warmer in Dahab: highs are around 32°C and lows about 21°C. Finish your sightseeing early on the 24th (Sun) so you can drive to Sharm El Sheikh. Discover out-of-the-way places like Coptic Orthodox Church and Submarine Tours. Spend the 25th (Mon) among aquatic life with a scuba or snorkeling tour. There's still lots to do: identify plant and animal life at Wildlife Areas, enjoy the sand and surf at Ras Um Sid, pause for some serene contemplation at The Heavenly Cathedral, and get outside with Stingray's Club. For other places to visit, where to stay, maps, and other tourist information, read Sharm El Sheikh trip app . You can drive from Dahab to Sharm El Sheikh in 1.5 hours. Another option is to take a bus. March in Sharm El Sheikh sees daily highs of 32°C and lows of 21°C at night. Finish up your sightseeing early on the 2nd (Tue) so you can travel to Hurghada. You'll discover tucked-away gems like Dolphin & Whale Watching and Jungle Aqua Park. On the 4th (Thu), spend a thrilling day on the water with a speed boat tour. Spend the 8th (Mon) in unforgettable company with a swim-with-the-dolphins experience. The adventure continues: fly like a bird with a parasailing or paragliding tour, indulge in some personalized pampering at some of the best spas, cool off at Makadi Water World, and go for a stroll along the water at Hurghada Marina. To see ratings, traveler tips, where to stay, and tourist information, use the Hurghada trip itinerary planning tool . You can do a combination of flight and bus from Sharm El Sheikh to Hurghada in 1.5 hours. Other options are to ride a ferry; or drive. In April, plan for daily highs up to 37°C, and evening lows to 22°C. Cap off your sightseeing on the 10th (Wed) early enough to go by car to Marsa Alam. Explore hidden gems such as Elphinstone Reef and Vivasub diving center. Pack the 15th (Mon) with family-friendly diversions at Aqua Coraya. And it doesn't end there: head outdoors with Abu Dabbab Beach, make a trip to Shaab Marsa Alam, enjoy the sand and surf at Marsa Shoona Bay, and take an in-depth tour of Astronomy Center. To find reviews, traveler tips, ratings, and more tourist information, refer to the Marsa Alam trip itinerary planning site . Traveling by car from Hurghada to Marsa Alam takes 4 hours. Alternatively, you can do a combination of flight and taxi; or take a bus. Traveling from Hurghada in April, expect nights in Marsa Alam to be about the same, around 24°C, while days are little chillier, around 34°C. Cap off your sightseeing on the 16th (Tue) early enough to travel to Abu Simbel. 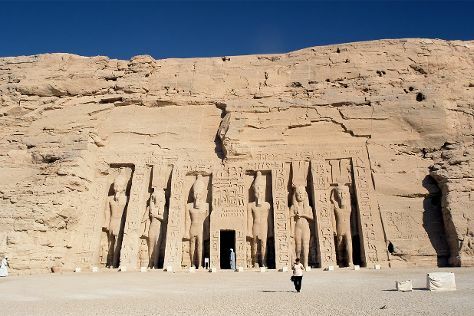 On the 17th (Wed), steep yourself in history at Abu Simbel Temple Complex. For reviews, ratings, photos, and tourist information, read our Abu Simbel vacation planner . Traveling by combination of taxi and flight from Marsa Alam to Abu Simbel takes 6.5 hours. Alternatively, you can drive. While traveling from Marsa Alam, expect a bit warmer days and about the same nights in Abu Simbel, ranging from highs of 39°C to lows of 22°C. Wrap up your sightseeing by early afternoon on the 17th (Wed) to allow enough time to travel to Aswan. Eschew the tourist crowds and head to Nubian Museum and Elephantine Island. Change things up with a short trip to Temple of Kom Ombo in Kom Ombo (about 1h 05 min away). The adventure continues: contemplate in the serene atmosphere at Philae Temple, take in nature's colorful creations at Kitchner's Island, delve into the distant past at New Kalabsha, and take in the architecture and atmosphere at Archangel Michael’s Coptic Orthodox Cathedral. Plan a Aswan trip in moments using our itinerary builder. Traveling by combination of flight and taxi from Abu Simbel to Aswan takes 1.5 hours. Alternatively, you can drive. In April in Aswan, expect temperatures between 42°C during the day and 23°C at night. Cap off your sightseeing on the 21st (Sun) early enough to catch the train to Edfu. Edfu is an Egyptian city, located on the west bank of the Nile River between Esna and Aswan, with a population of approximately sixty thousand people. Kick off your visit on the 22nd (Mon): explore the ancient world of Gibel Silsila, then explore the ancient world of Kanais, and then explore the ancient world of Temple of Horus at Edfu. 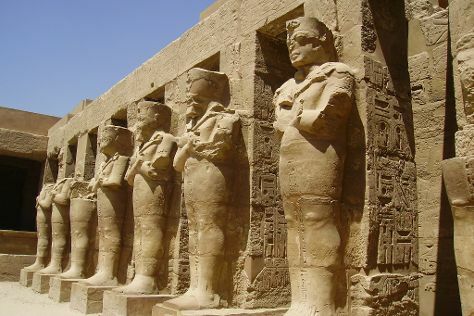 Planning Edfu trip won't be overwheling when you use's Insprock itinerary maker. Traveling by train from Aswan to Edfu takes 1.5 hours. Alternatively, you can drive. In April, plan for daily highs up to 41°C, and evening lows to 21°C. Finish your sightseeing early on the 22nd (Mon) so you can take a train to Luxor. You'll explore the less-touristy side of things at Medinet Habu and Valley of the Artisans (Deir el-Medina). Change things up with these side-trips from Luxor: Temple Khatkhor (in Dendera) and Temple of Hathor at Dendera (in Qena). There's lots more to do: delve into the distant past at Temple of Karnak, stroll the grounds of Valley of the Kings, pause for some photo ops at Temple of Hatshepsut at Deir el Bahari, and contemplate in the serene atmosphere at Luxor Temple. To see reviews, ratings, other places to visit, and other tourist information, refer to the Luxor trip planner . Traveling by train from Edfu to Luxor takes 1.5 hours. Alternatively, you can drive. In April in Luxor, expect temperatures between 41°C during the day and 21°C at night. Finish your sightseeing early on the 29th (Mon) so you can travel back home.